The online version of Today’s Machining World continues to produce new feature stories such as this one from our best freelance writers. You can increase production and reduce costs by exploiting what different jobs have in common. The most obvious kind of part family is made up of items that share a name and geometry – 8-32 pan-head screws in different lengths, or a series of standoffs that come in different lengths, perhaps with different features (through hole or internal thread). cut with the same set of tools. Sometimes it’s hard to see these commonalities, but once you do, you can use them to boost production by reducing setup and changeover time, minimize programming effort, or improve other aspects of your process. You can expand this type of family by making the most of the limited space in the tool magazine – try to optimize the selection of tools to cut the greatest number of parts. Can you use one drill instead of three in different lengths? Usually people know when they a have family of parts, but don’t necessarily know how to make the most of it, said Wendy Swann, product manager, Chick Workholding Solutions, Warrendale, Pa. Workholding is generally the least-noticed aspect of machining part families, she said. However, the benefits of a family approach to workholding can be considerable. “If you are using the same set of jaws, the offsets are the same,” she said, saving time on every part you load. For example you could use stepped jaws. The top, wider step could hold larger parts, the lower step or steps could hold smaller parts, Swann said. 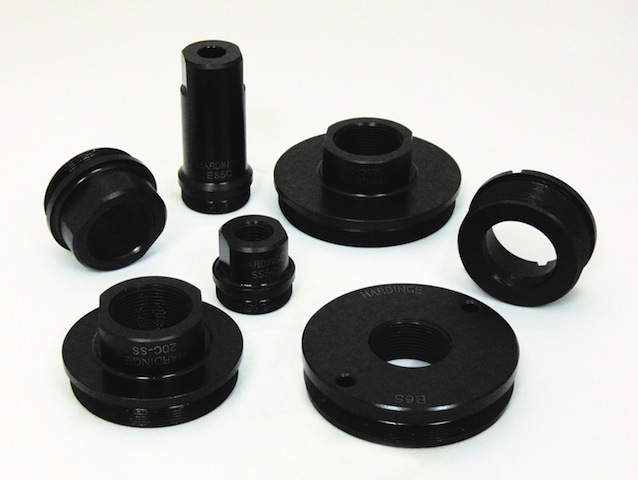 For milling round parts, you can use V-shaped jaws to hold a large range of diameters. Your suppliers can help sort out how best to approach your workholding. “Typically [customers] share with us a sampling of part prints. We take those parts and separate them out into families using similar workholding,” said Schonher. As you add parts to a family, you may be able use portions of previously written programs. Suppose you are already making a part with a particular feature on it, and the customer asks you to make another part with the same feature – in a different size or location. You can copy the relevant section of the program and use it again, with appropriate adaptation. More advanced software features help you to do more. If you repeatedly program a certain feature or process, you can write a macro, which will automatically run the desired series of commands. Plug-ins, often written by consultants, can take this approach to another level. Any opportunity to group, streamline, consolidate, rationalize, or optimize programming, tooling, workholding or other aspects of production can benefit your whole operation. The fact you have a family of parts is not important. What you do with the family – how you use the family’s characteristics to help you increase production and reduce costs – that is the advantage you can gain from recognizing what parts have in common. A family of parts. Photo courtesy of Hardinge. Question: If you were forced to choose between Budweiser and Miller which one would you drink? I’d die of dehydration. Seriously, we are in a golden age of American brewing; there are many great brews available – they cost more, but you’ll drink less and enjoy it more. Find a good brewery in your area and support it. I wholeheartedly agree with John Shea’s above comment. As a self proclaimed beer snob I would never in a million years even consider drinking the pedestrian aforementioned “beers”. Support your local small breweries!